The ALB Library has begun implemeneting a project to tag all library materials with the latest RFID technology used in library theft detection systems, inventory control and efficient staff stack maintenance. 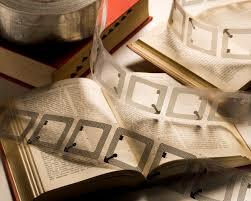 The RFID tags not only detect unauthorized removal of library materials, but speed staff checking in and checking out of library materials, enables self-checkout, and supports electronic inventorying and shelf searching using hand held scanning devices. The Canisius College Archives Speaker Series Presents Paul Lubienecki, Ph.D., Catholic Labor Historian and Vice President, Steel Plant Museum, Buffalo. He will speak on Buffalo's Catholic Labor Schools: Uncovering Resources That Shaped a Business Model. This event will take place on Thursday, September 26, 2013 at 2:00 pm on the second floor of the ALB Library. Light refreshements will be served. For more information contact: Ext 8421. Sponsored by Rev. J. Clayton Murray. S.J. Archives & Special Collections ALB Library, Office of Mission and Identity, and Catholic Studies Program with assistance from the Office of Campus Ministry. 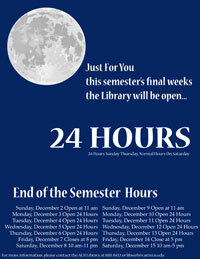 Back by popular demand ---during the semester’s final weeks, the Andrew L. Bouwhuis Library will remain open 24 hours Sunday through Thursday with regular hours on Friday and Saturday. Extended hours begin this Sunday, December 2 at 11 a.m. and will continue through Saturday, December 15 when the library will close at 5 p.m.
During this period, additional “Silent Study” areas will be designated in the Library Instruction Room on the first floor, and Library Conference Room on the lower level. Guidelines for use of these rooms will be posted in the areas. Online room reservations will be available for other group study rooms. A reference librarian and other staff members will be available for assistance throughout the 24 hour opening period, and public safety also will be in the library during this time. Students faculty and staff are reminded that after 10 p.m. a valid Canisius College I.D. will be necessary to enter the library. Please note—weekend hours remain in effect for Friday and Saturday. The library will open Sunday, December 2 at 11 a.m. and remain open for 24 hours through Friday, December 7 with closing at 8 p.m. On Saturday, December 8 regular hours are in effect from 10 a.m. to 11 p.m. The library reopens Sunday, December 9 at 11 a.m. and remains open for 24 hours through Friday, December 14 with closing at 5 p.m. Saturday, December 15 hours will be 10 a.m. – 5 p.m.
Daily hours are posted on the library home page in the upper right hand corner at http://library.canisius.edu/ or check the Library Hours Page. 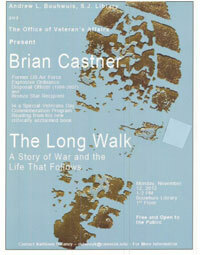 Western New York’s Brian Castner will read from his critically acclaimed book, The Long Walk : A Story of War and the Life that Follows, in Andrew L. Bouwhuis, S.J. Library, on Monday, November 12 at 1 p.m.
Castner, a Marquette University graduate, served as an Explosive Ordnance Disposal (EOD) officer in the U.S. Air Force from 1999 to 2007, deploying to Iraq to command bomb disposal units in Balad and Kirkuk in 2005 and 2006. He and his team “disabled roadside IEDs, investigated the aftermath of roadside car bombings and searched door to door to uncover bomb-makers at their homes.” He is a Bronze Star recipient who continues to train EOD teams to disable bombs, as a civilian. His memoir offers a hard look at the reality of war and the effect on warriors “in country” and back home. Critics have compared The Long Walk … to Erich Maria Remarque’s, All Quiet on the Western Front, and recognize Brian Castner as a gifted writer whose candor will strike a chord with veterans of all wars, and those who love them. Also in the library are several displays from Archives & Special Collections of historic documents and artifacts related to past wars and veterans. These include a selection of original newspapers, government documents (and some propaganda), scrapbooks and a recent acquisition of greeting cards [ca. 1944-54] meant to "support the troops". YALT students researched and created a display on the lower level focused on patriotic themes. The ALB Library joins with the Office of Veterans Affairs and YALT offer these special events in honor of all Veterans of all wars. Events and displays are free and open to the public. Contact Kathleen DeLaney, archivist/reference librarian at delaneyk@canisius.edu or ext. 8431 for details. 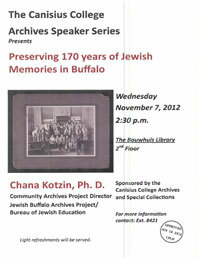 The 2012-13 Canisius College Archives Speaker Series will present Chana Revell Kotzin, Ph. D. Community Archive Project Director, Jewish Buffalo Archives Project/Bureau of Jewish Education speaking about “Preserving 170 Years of Jewish Memories in Buffalo”, Wednesday, November 7, 2012 in the Bouwhuis Library, 2nd Floor from 2:30-4 pm. Dr. Chana Kotzin was born and educated in Britain, and initially followed a career in geological sciences including stints on various North Sea oilrigs. In 1994, she retrained as an historian and received a Ph.D. in History from the University of Southampton in the UK in 2000. Her doctoral dissertation focused on the ways in which European Jewish refugees fleeing Nazi anti-semitism were received in Britain during the 1930s. Dr. Kotzin has served as guest curator, scholarly advisor, and researcher for an exhibition at the Jewish Museum of Maryland, “Lives Lost, Lives Found: Baltimore’s German Jewish Refugees, 1933-1945”. She has researched and written oral histories for the Jewish Women’s Archive (JWA), an on-line resource for the history of Jewish women, with the aid of fellowships and grants from the Hadassah-Brandeis Institute and the Jewish Women’s Archives. She has also researched and written about aspects of Jewish women’s history in the twentieth century, and has published works in Shofar, The Journal of Holocaust Education, and Jewish History and Culture and has taught courses on Anglo-Jewish History and Modern Jewish History. The Archives Speaker Series showcases scholars with a special understanding of archival research, based on their own experiences; and who have completed a book or other expression of scholarship reliant on archival research. 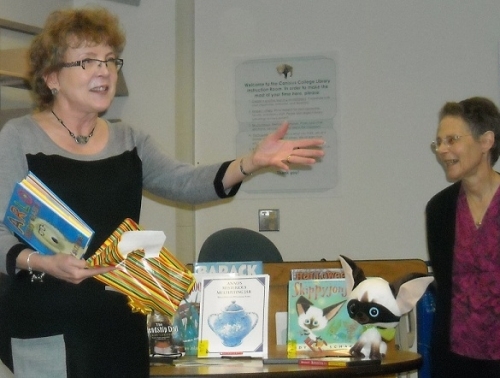 Today the library held a celebration to thank Dr. Deb Beis for her continuing dedication to improving our collection of children's literature. Deb is always bringing us treasures to add to the Curriculum Materials Center. Her donations now total over 2,000 titles. The Andrew L. Bouwhuis, S.J. Library received the 2012 Outstanding Library or Library Program Award from the Western New York Library Resources Council (WNYLRC) on Wednesday, October 17 at its 46th Annual Membership Meeting on Wednesday, October 17, at the newly renovated Hotel @ The Lafayette. This prestigious award was given for Outreach Programming and Services for Non-Traditional Students in the Buffalo and Western New York Communities before an enthusiastic audience of colleagues at WNYLRCs 46th Annual Membership Meeting at the newly renovated Hotel @ The Lafayette . The library was nominated for its work with YALT, a Day- Habilitation program located on the Canisius Campus. Through an ongoing and growing solid support program in the library, young adults with developmental disabilities enrolled in People Inc.’s Young Adults Learning Transition (YALT) have an enhanced opportunity to experience life on a college campus while developing functional skills. The nominators cited the librarians and staff for developing personal relationships with these students, and creating additional programs to be supportive of their needs as well as and beyond attending to those of the Canisius students. Since 2009, under the direction of your Canisius librarians, YALT students have engaged in a book club, creating library displays (see the display in the lower level), learning how to use databases to search for resources, and reading call numbers. Staff have worked with YALT students through the gamut of library services to provide tours of departments with an eye toward learning job skills, and encourage participation in library programming such as Banned Book Week, Seasons Readings, Black History Month and Archives Speaker Series, and become more fully engaged in local history tours. Their newest venture—composition of a graphic novel. People Inc.’s Brandon Morrisey wrote in his nominating remarks: My students are not traditional college students--they have disabilities that would typically bar them from experiencing college. The students work on life skills such as: getting a job, becoming independent, moving out of their parents’ house, and obtaining a GED…Our presence on campus is largely the result of the exemplary role Canisius provides regarding inclusion, serving the community and promoting education. Specifically, the library has shown itself to be particularly supportive and beneficial to my students…My students choose to go to the library in their free time. This is due to the warm environment the staff provides. Their appreciation and love of libraries will be forever marked by the enthusiastic and welcoming attitude shown to them in the library. The staff’s willingness to create independent learning situations … will dramatically affect (students’) futures,(and) speaks to their dedication. The intimidation these students might feel elsewhere is absent in this friendly and supportive environment. Their efforts are awarding-winning level. Accepting the award for the Canisius College Andrew L. Bouwhuis, S.J. Library were Kristine E. Kasbohm, Library Director, Kathleen DeLaney, Archivist/Reference Librarian and YALT Library Program Coordinator and Brandon Morrisey, Program Instructor, People,Inc. Daniel M. Di Landro, MLS, CA, archivist and special collections librarian at Buffalo State College, who will address issues of access, restriction and sensitivity to donor wishes related to two large archival collections at his institution. The Collection of Madeline Davis, when fully processed, will provide researchers insight into the birth of the LGBT movement and gender issues in Buffalo and western New York as reflected in a collection of assembled over more than 50 years. The Lester Glassner African American Experience Collection: Artifacts, Sheet Music, and Ephemera provides contextual insight to a collector and his process to collect a vast assortment of uniques artifacts, and other materials that capture attitude toward and promotion 19th through 20th century thought related to African-American’s. Richard Reitsma, PhD assistant professor, department of modern languages, will present Banning Books, Trafficking and Cultural Censorship: Arizona and the Argument Against History and Diversity. He’ll examine recent controversial challenges to the Arizona and local school boards’ educational policies, their effect on Latino/Latina authors, and intellectual freedom. Stephen Chanderbhan, PhD assistant professor, department of philosophy, will reflect on the motivations for the Index Librorum Prohibitorum, the Catholic Church’s list of banned books. The Index was an official element within the Church from the mid-16th century until its abolition in 1966. One of the aims of the Index was “to preserve the faith and morals of Catholics.” Chanderbhan will also touch on the monitum issued against Father Pierre Teilhard de Chardin, and the public critique by the U.S. Conference of Catholic Bishops against Sister Elizabeth Johnson’s book Quest for the Living God. Canisius College Andrew L. Bouwhuis Library hosts its 4th Annual Banned Book Week in coordination with the annual American Library Association (ALA) commemoration from Monday, October 1 – Friday, October 5, 2012. The daily Read Out remains the feature of this week-long commemoration from 12:05 – 1:00p.m. College President, John J. Hurley opened this year’s Banned Book Week with a ceremonial Cutting of the Yellow Caution Tape on Monday, October 1st at 12:05 pm on the library’s first floor adjacent to the Vogt Gallery. Banned Book Week celebrates intellectual freedom, including freedom to read, benefits of free and open access to information, and also draws attention to the harms of censorship by spotlighting actual or attempted banning of books, currently and historically. Canisius librarians use this week to encourage dialogue that supports freedom to access information, artistic expression, and tolerance. By using the theme, TOLERANCE, the librarians emphasize their long-held professional ethic ---intellectual freedom for all. They join their colleagues throughout the U.S. in this annual commemoration, now in its 30th year. The first Banned Book Week was held in Chicago, and continues there in Bug House Square across from the Newbery Library where speakers and readers address the crowd from old-fashioned soap boxes. As a nod to our colleagues in Windy City, your Canisius Librarians have dubbed their Read-Out space, Bug House Square East. The Read Out offers participants an opportunity to read aloud from classic books once censored, considered improper, or challenged for ideas (e.g., racism; politics; ethnicity; language; etc.) Readers may participate in one or all five Read Outs. Readers may choose to select a short, evocative written piece that may have impacted their own attitude toward censorship or tolerance. Participants share their selection, usually with short remarks to place it in context. Please prepare a reading of no more than 5 minutes to allow for all participants to share. A sign-up board for a specific time will be available on Friday, September 28 near the library service desk. On Friday September 14th the Andrew L. Bouwhuis Library held the 10th Annual Faculty Recognition Ceremony and Reception on the 2nd floor of the library. Fifteen Canisius faculty members who were recently promoted, or granted tenure or emeritus status were recognized and presented a certificate of achievement by President John J. Hurley. 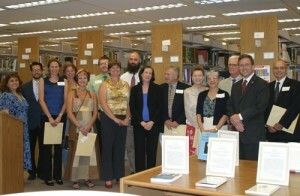 Honorees were also invited to dedicate a book of his/her choice to the library’s main collection. The books are now on display in the library on the main floor. Those faculty members who were promoted to full professors were Barbara Burns, PhD, adolescence education and Margaret C. McCarthy, PhD, graduate education and leadership. The faculty members awarded tenure and promoted to associate professor were Nancy M. Bailey, PhD, adolescence education; Richard A. Bailey, PhD, history; Michael J. Braunscheidel, PhD, management; Lorreine K. DiCamillo, EdD, adolescence education; Jonathan M. DiCicco, PhD, political science; Corinne M. Kindzierski, PhD, education; Phillip M. Sheridan, PhD, chemistry and biochemistry; and Anne Marie Tryjankowski, EdD, graduate education and leadership. The faculty recognized for achieving emeritus status were Peter J. Galie, PhD, political science; John E. Kelly, PhD, philosophy; Janice Schultz-Aldrich, PhD, philosophy; James Sylvis, PhD, kinesiology; and George Wenner, PhD, education.